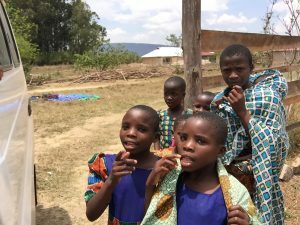 November 9, 2016, we left our respective towns (Odisha, India, Austin, Texas and New York City) to travel to the Iringa province in Tanzania. Three years ago Gram Vikas USA began construction of water and toilet facilities in two villages, Kibena and Lumuli, in the province. Around 9pm on November 11, 2016, after almost 48 hours of travel, we reached Ulete Parish, about an hour’s drive from the Irigina bus station. We were welcomed by a group of nuns singing and dancing around our SUV. The Parish is home to around 45 nuns who live, eat, work and pray on this campus. The village of Ulete has a central church that accommodates more than 300 people for Sunday service. Father Augustine is the priest, who heads the church. Our first day, we visited Kibena, a village with around 600 families. Families are divided into “hamlets” of 50-150 households. Gram Vikas USA identified a natural water source, which is located 6,260 feet above sea level. According to Joe, it is some of the best water that he has ever drank and he has been identifying water sources for over 40 years. After inspecting the water source we travelled to the reservoir, which is 6,020 feet above sea level. There is a 240 foot difference between the water source and the reservoir. Therefore, due to gravity, the water pressure is more than sufficient. This reservoir, with over a 50,000 gallon capacity, is the largest ever built by Gram Vikas. The distance that the villagers dug for the placement of pipes, between the source and the reservoir, is over 9.3 kilometers. Our mode of transportation was a rickety old Toyota Land Cruiser. We sometimes did not think it could travel over the terrain but it did not fail us. When we inspected the reservoir, it was dry. Water had stopped flowing into the reservoir due to a leak about 2 kilometers away. Our technician, Paulo drove on his dirt bike to grab his wrench to fix it. Around 3pm, water started gushing into the reservoir. Apparently the leak was caused by local government construction. Due to this leak, the nearby hamlet did not receive running water. On our second day, we visited Lumuli, which is the second village where Gram Vikas began constructing water and sanitation facilities. The village is located at an elevation of 5,660 feet. We started hiking up a hill to view their water source. Since the water is a flowing stream, the water has to be chlorinated before being supplied to the reservoir. The plan included construction of a chlorination tank next to the reservoir. The local people had constructed a small water tank to store water from the source, which then could be used in the construction of the larger reservoir. This little tank was located at an elevation of 5,750 feet, about 90 feet above the village. After 30 minutes of hiking, we reached the source, which is located at an elevation of 5,900 feet (240 feet above the village). 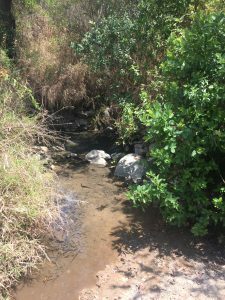 There is continuous water flow sufficient enough to serve the entire village of Lumuli. In the afternoon, we visited the second hamlet of Kibena village. The second hamlet is located at an elevation of 5,710 feet (310 feet below the reservoir). Since Paulo had fixed the broken pipe, water was up to a third in the tank and this hamlet was receiving plenty of water. We tested the taps in the toilets and the bathing room and there was clear water flowing through them. Sister Jane, one of the nuns who has been helping us, said that water borne diseases, such as diarrhea were cured due to the clean water. She also said that the water they received did not need any further purification. On our last day, we visited a third hamlet of Kibena village, where construction of toilets had stalled due to unknown reasons. We requested the chief of the village to call a meeting to inquire about the delay. The chief expressed his disappointment with the progress of toilet construction in that hamlet, and agreed to address this issue at a village meeting with all the villagers. By 4pm, more than 200 villagers had amassed at the village center, where important events are held. The chief thanked the entire Gram Vikas USA team for supporting their village and believing in them. He also expressed disappointment with the construction of toilets in the third hamlet, and promised that the work would be completed within the next few months. He pointed out to the villagers the benefits of having access to clean water, and after hours of deliberation, the villagers all agreed and promised to finish the work as soon as possible. On our last day, we all headed our respective ways. 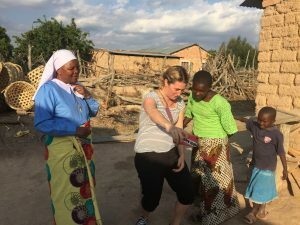 However, Deanna decided to stay back in Iringa and spend some time with Sister Jane since they had previously met when the project began.